The Chennai Ashtalakshmi temple is situated in Besant Nagar(SEE IN MAP), on the shores of the Bay of Bengal. That stretch of beach is known as the Elliot's beach. 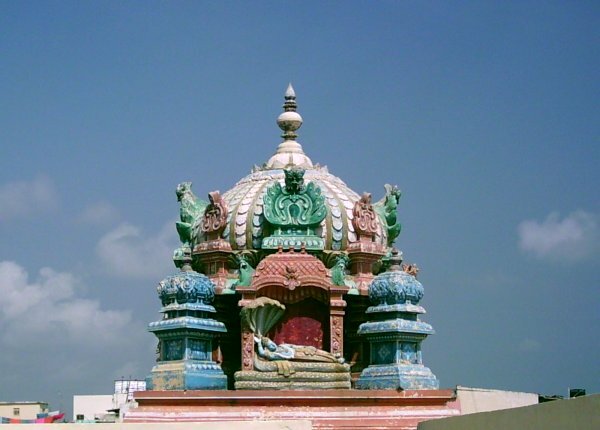 The temple was constructed on the express wishes of Sri Mahaa Periyavaal of Kanchi Mutt, Sri Chandrasekara Saraswati Swamigal. 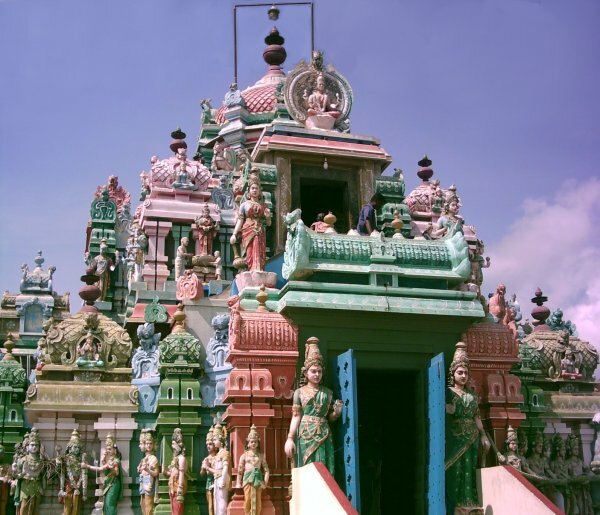 The temple's architecture is unique, with the deities installed in four levels. The shrine of Mahaalakshmi & Mahaavishnu (the principal deities) is in level two. Here one can see the imposing, bigger than life vigrahams facing the eastern horizon overlooking the sea. Walking up the stairs to the third tier, the path leads to the shrine of Santaana Lakshmi (bestower of offspring) facing south. Next we get the darshan of Vijayalakshmi (bestower of success in all ventures, vijaya - success), on the western side on the 3rd tier. Vidyaalakshmi (associated with learning & wisdom) sits facing the northern side & the shrine of Gajalaskhmi (bestower of all round prosperity) is located facing the eastern side on the 3rd tier. A flight of few steps above leads one to the 4th tier, where the Dhanalakshmi (Goddess of wealth) shrine is located facing eastward. Her's is the only shrine on the 4th level. Exiting the main shrine - the principal deities, at the ground level on the southern flank of the gopuram is the shrine for Aadhi Lakshmi. 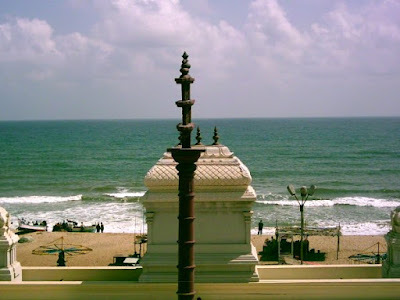 One the western flank is the shrine for Dhaanya Lakshmi (Goddess of food grains). 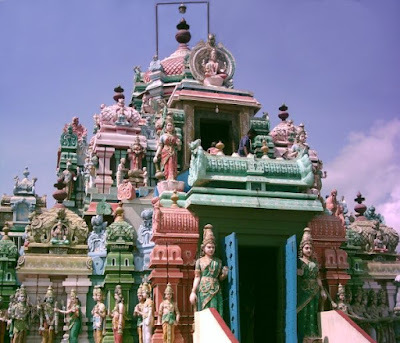 Dhairiya Lakshmi's (the Goddess of courage & strength) shrine is situated on the northern flank. There is a huge hundi for Venkataachalapathi within the complex. 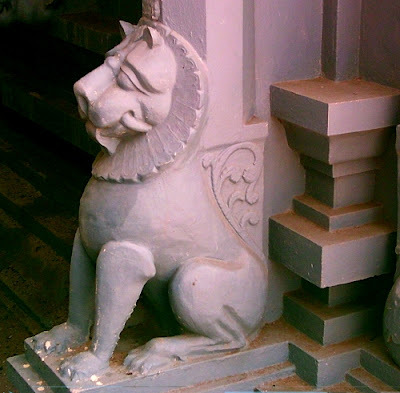 There is a sannadhi for the 10 incarnations of Lord Vishnu, to the left of which is the Madapalli (the kitchen for preparing naivedhiyam for the Gods). There are shrines for Tumbikai Aazhwar (Ganesha), Guruvaayurappan, Chakrathaazhwar & Narasimhar (on either side of the same idol), Aanjaneyar & Dhanvantri.